To enjoy reliable cooling, you need two things: the right products and the right professionals. 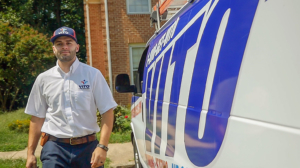 At Vito Services, we offer both to customers with our AC services in and around Alexandria, VA. Whether you need air conditioning installation service or an AC repair, we back our expertise with the best products our industry can provide. We are your one-stop solution in the Washington, DC, area for air conditioning services, specializing in everything from sales and installation to repairs and maintenance. We are proud to serve customers across Maryland, Virginia and Washington, DC. Tell us what you’re looking to achieve with your residential cooling—and Vito Services will make it happen! Click here to see our entire service area. According to energy.gov, a new central air conditioner could save you up to 40 percent on your utility bills compared to an air conditioner just 10 years old. Why such a drastic change? Now more than ever, manufacturers are placing an emphasis on energy efficiency. It isn’t about which system can work the hardest or the fastest anymore. It’s about which system can work the smartest. This means keeping your home at a consistent, comfortable temperature—and saving energy in the process. At Vito Services, we understand that rising energy costs and environmental issues are important concerns. That’s why we install air conditioners that are both efficient and Energy Star-certified. This means your unit will be at least 20 percent more efficient than the products currently meeting minimum federal government standards. Whether you care about quiet operation, a high SEER rating, luxurious comfort control or all of the above, Vito Services has what you need. We welcome you to request a free in-home estimate for air conditioning installation service in Silver Spring, MD, Rockville, MD, or elsewhere in our service area. Why Choose Vito for AC Services? When the summer heat is at its worst, the last thing you need to worry about is an AC meltdown. Vito Services offers every air conditioning service under the sun—at a fair price you can feel good about. To request service in the Silver Spring area, Alexandria, VA, or elsewhere in Montgomery County, MD, Prince George’s County, MD, or other neighborhoods in the tri-state area, call your local Vito Services office or schedule an appointment online today.